The DAA Single Stack Magnetic Pouch is our latest magnetic pouch design, offering an ultra-compact and ultra-efficient magazine holding system for single stack shooters. It positions the magazine only in the 90 deg “away from the body position” and is an excellent option for shooters who choose to carry their magazines this way, as many single stack shooters do. The DAA Single Stack Magnetic Pouch utilizes two small yet powerful magnets that hold the magazine firmly in place while allowing it to rest inside its supporting track. The track guides the magazine in and out of the pouch and prevents it from accidentally being dislodged. The release achieved from this magnetic pouch is the smoothest of any of our magnetic pouches, partly due to the smaller contact area with the single stack magazines. The belt hanger is the same as that used in the Racer pouches - the same minimalist steel plate design which eliminates separation between your inner and outer belt. The pouch can be adjusted for tilt in very small steps, allowing you to find your preferred angle. Once the correct angle is set and the center screw tightened, the serrations in the connector piece lock up, preventing any possibility of the pouch rotating until the center screw is loosened several turns. The ultra-narrow design of the pouch body and hanger allows you to place many pouches side by side close together on your shooting belt. 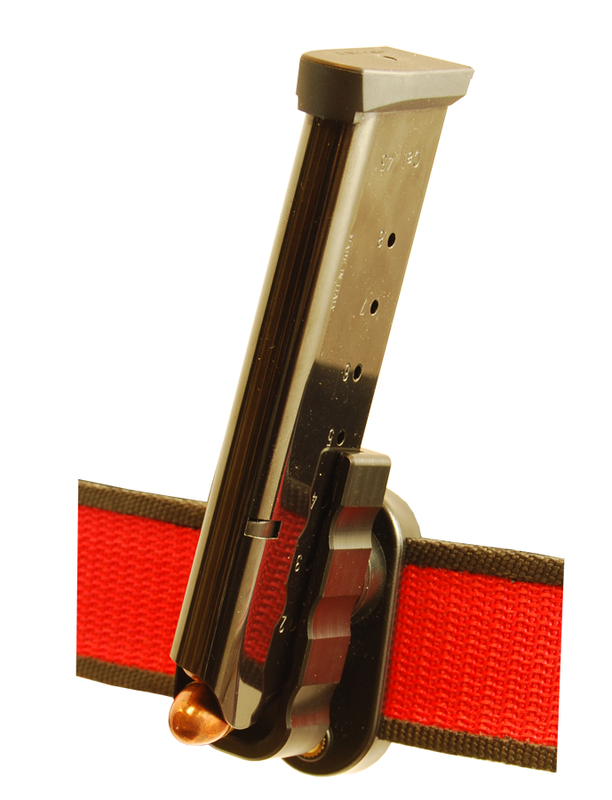 Even smaller shooters can carry enough single stack magazines without having to reach very far back for their 5th or 6th magazine. Available in Black only in ambidextrous design for right- or left handed shooters. Note: Under USPSA rules Magnetic pouches are not legal for use in Single Stack and Production Divisions.